← Becky Watts – the convicted duo’s legal Appeals are now in, aren’t they? The demise of a top football manager – good riddance ‘Jose Mourinho’? Many people not interested in soccer football were very annoyed last week to find the English national news being dominated by the story of manager Jose Mourinho getting the preverbal boot by London’s Chelsea Football Club. It is the second time he got it there, but he is quite experienced in getting his marching orders from other clubs he has managed around the world, hasn’t he? What the puzzled masses didn’t realise was that this was such a major event in Premiership football and indeed in the football world. Portuguese Mourinho you see is undoubtedly a top guy as a manager, who has won the European Cup twice (with different teams), won league trophies everywhere with his teams in Portugal, England, Italy, and Spain – indeed his Chelsea team trounced all comers to walk away with the English title just last season, and were widely expected to win again this season. Instead, the same lot have played like a bunch of lemons and ended-up near the bottom of the table, indeed only one point off the threat of relegation. [At the start the die was cast surely when they lost the FA Community Shield game to Arsenal? Despite being holders of the League Cup they were knocked out in the fourth round by mid-table Stoke]. While this was all happening the maestro-manager was increasingly losing the plot, and behaving in inexplicably bizarre ways. He went berserk in a spat with the respected female club doctor Eva Carniero and has Chelsea now facing an expensive humiliating court case as a result. At each defeat he has berated the referee as being the cause. He has been constantly morose in interviews with the media, and claimed his team were victimised and discriminated against. He has got banned from the touchline by referees, and even banned from the stadium by the FA, as well as fined. Then, instead of motivating his players (all talented, expensive, top quality), he has demoralised them with public criticism and lambasting them – they no longer enjoyed playing for him, did they? After his last defeat he even blamed the local ball boys for the team’s shocking performance. He then issued the accusation of his players ‘ betraying’ him – what planet is he on? His obsessive self-belief, massive egoism and amazing self delusional description ‘The Special One’, could not let him accept any personal responsibility for his team’s suddenly falling apart, could it? The owner of Chelsea, rich Russian Roman Abramovich was certainly adverse to showing Mourinho the door again, but his behaviour was bringing the club into widespread disrepute, and the football being played there was a total embarrassment to the club’s image – it was clear also that he had lost the dressing room with no chance of redemption (confidence and heads were well down). Results were not going to get much better, and there was already no chance of achieving an acceptable league end-position for such a big club – moreover they were still in the prestigious Europe’s Champions League last 16, the FA Cup 3rd round, and change was certainly required if not essential, if they were to make any headway in those competitions, so the club’s season could be salvaged. Nevertheless, the soccer pundits were apparently astounded by the events that evolved with Mourinho’s demise – while us ordinary observers were surprised it took so long, eh? It seems that managers should be a protected species in a game where they are the ones who arbitrarily decide on players’ futures and careers, deciding where and when they play, dropping them from the team, or even offloading them when their face no longer fits, eh? The problem with Mourinho is that he lacks staying power – he has a couple of years of big success at all his clubs, then results drop, then he p’s everybody off and gets sacked or he leaves. That is precisely why the man hated Frenchman Arsène Wenger Arsenal manager so much, whose longevity now stretches to twenty years at his club (so Mourinho became a green-eyed monster rubbishing him at every turn, and amongst other things over the years has more recently even called him a ‘specialist in failure’). As the saying goes ‘the proof of the pudding is in the eating’, and yesterday Chelsea hit the field for the first time with the manager gone, and they had quickly amorphized back into a proper football team, playing with intent, competitiveness, assurance, class, determination, confidence, pace and skill – getting a win at last (only their fifth of the season after 17 games), albeit over a rubbish opponent who made it easier for them on the day, but they are still only four points above the relegation zone, so could still be in for a battle for survival, eh? The other big boy in English football under the pressure of dismissal is Manchester United’s sour manager Dutchman Louis van Gaal (LVG), because the iconic club boasting a squad of four hundred million pound worth of players (the most expensive ever put-together in English football in LVG’s first year in charge) are now having a dismal season in the Premiership, and yesterday they even got beat in a shock at home by lowly mediocre Norwich. LVG has turned the team into an incompetent, defensive, poor footballing, shambles that disgusts the experienced fans used to better. This club is of course nowadays more of an American business cash generator venture, than a traditional English football club, so the now panicking owners are more concerned about its worldwide perceived value than any poxy manager, aren’t they? The club are still in the FA Cup (3rd round), but are already out of the top four in the league, out of Europe’s Champions League and even out of the humble League Cup. His earlier arrogant posturing about his long-term security at the clubs has turned into the white-faced defensive and nervous uttering’s of someone fearing the end is nigh. If he cannot, like a magician pull a rabbit out of the hat in the next few weeks, he will get the chop as the militant fans are already chanting for his blood. 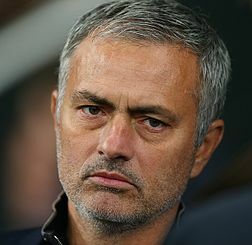 His plight is not helped by the fact both that Mourinho being axed at Chelsea shows that such things can be done swiftly, and also that Mourinho coverts the challenge of Man U like a dream – and he is a free agent now to collect such a prize if it becomes available, isn’t he? It was a bit of a surprise to many that LVG got this big job a year ago anyway. 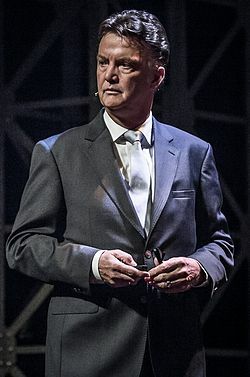 He certainly has experience, being the former manager of Ajax, Barcelona, AZ, and Bayern Munich , but it was probably on the back of him being manager of Holland at the 2014 World Cup. His team on the surface did well reaching the semi-finals (very lucky in some matches), but anyone who knows anything about football could have told you that they played poor football and were one of the dirtiest sides taking part. Man U should not therefore be surprised at the way he has transformed their normally brilliant football team into a bunch of unnatural, unadventurous, response-less, slipshod team, of losers, should they? This entry was posted in celebrity, europe, Football, media, newspaper, Other Countries, personalities, russia, Sport and tagged 'The Special One', Arsenal, Champions League, Chelsea Football Club, English Football’, Eva Carniero club doctor, fa, FA Community Shield, Frenchman Arsène Wenger, Jose Mourinho, Louis van Gaal, LVG, Man U, manchester united, Premiership Football, Russian Roman Abramovich. Bookmark the permalink.